The Minki Cheng SS16 collection at London Fashion Week drew inspiration from the designer's own travel experiences and explorations with references from expressionist painter Richard Diebenkorn's earlier work. 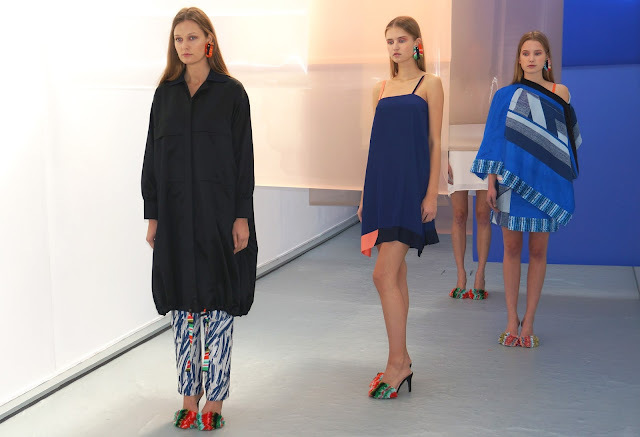 I loved the pops of colour from the Minki Cheng SS16 collection and the subtle use of geometric prints. The SS16 collection featured some fun casual summery pieces like the playsuit and cool bomber jackets pictured above as well as some elegant cuts ideal for those summer soirées. Lets me not also forget the statement shoes that complimented the outfits, I could definitely do with having a pair in my wardrobe for the summer.